An eccentric personality whose innovative ideas about art often placed him at odds with critics of his day, Whistler has proved to be one of the most influential artists of the late nineteenth century. Several of his paintings of the 1860s reflect his interest in Chinese and Japanese arts. Revealing a preference for asymmetrical compositions with brightly patterned surfaces, Whistler incorporated such exotic props as screens, woodblock prints, and ceramics in portraits of European women posed in Oriental costumes. 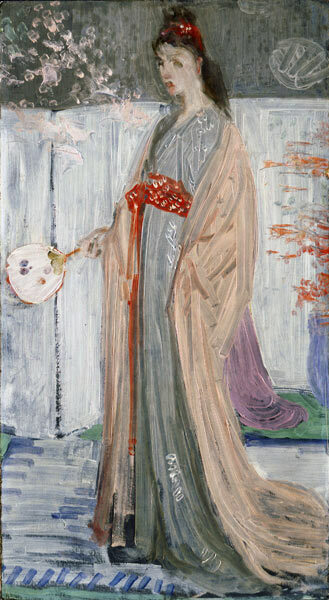 Worcester's painting is a preparatory study for a portrait of Christine Spartali, whose father served as Greek consul-general in London while Whistler was there. This fluidly brushed sketch blocks out the general arrangement and color scheme of the more detailed work. The final portrait, which the consul-general refused to buy, became, about a decade after its completion, a focal point in the dining room of Whistler's first significant patron, Frederick Leyland. Whistler transformed the room (now housed at the Freer Gallery of Art, Washington, D.C.) into a luxuriant setting for Leyland's collection of blue-and-white porcelain, thus giving rise to the title of the larger portrait and this sketch.